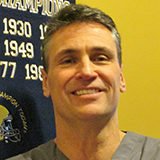 Dr. Gregory Iavarone is a former professional baseball player with the New York Yankees, Chicago Cubs and Texas Rangers. His passion for helping others, along with an interest in athletics and human performance led him into healthcare. Dr. Gregory Iavarone is a lecturer to family practice and internal medicine doctors treating neuromuscular conditions at Lutheran General Hospital in Park Ridge.